Never been to Cyprus? Take it from us, you should go. An easy 4 hour flight from Dubai will get you there. Enjoy the glorious hospitality and generosity. Living and working in Dubai is a fantastic experience for most people and like most people a break from the city now and again is very welcome. The Leptos Group recently invited us to the Republic of Cyprus, as part of a group of journalists from the GCC region, and we’re now completely enamoured by the wonderful island of Cyprus. Where is Cyprus? Oh, well that’s the good bit (there’s even better to follow). Cyprus is slap bang in the centre of the universe, well, almost. 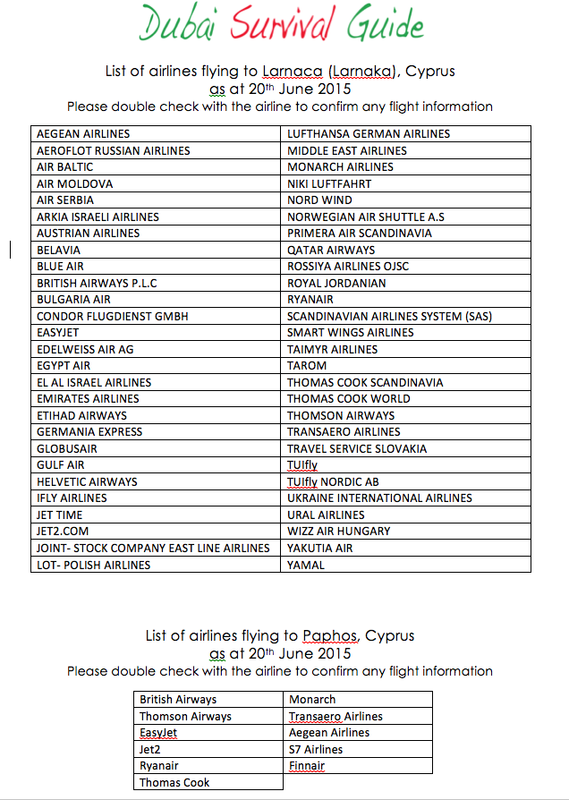 Bear in mind that Emirates flies to Cyprus, well, Larnaca to be precise and Etihad flies from Abu Dhabi but here’s a thing, it’s only a 4 hour flight. The airport in Paphos has been upgraded and if you’re visiting the west or south west of the island this is a nifty little number and no distance from the town itself. 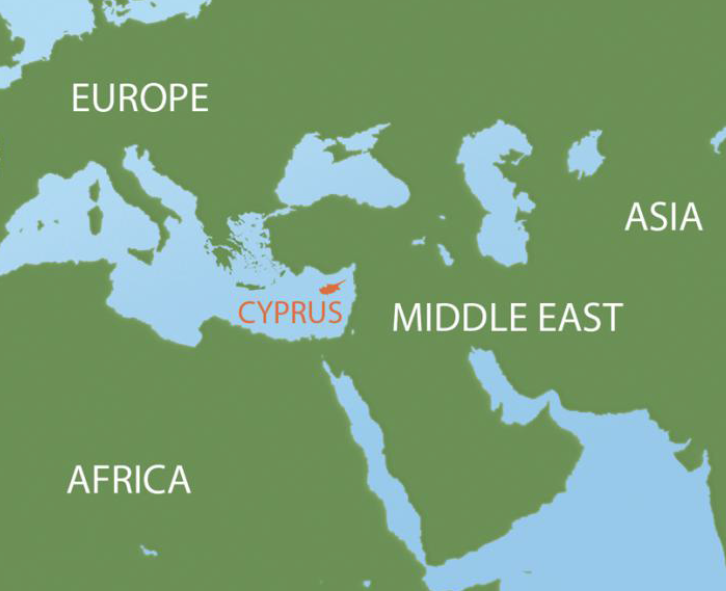 Once you arrive in Cyprus you can travel every which way north, south, west and east easily. Public transport is excellent or you can hire a car – just remember that they drive on the left so be careful if you’re used to driving in the UAE. The traffic is not heavy or crazy though so you’d be safe enough – a good starting point is to remember to keep the steering wheel (and therefore you, the driver) nearest to the centre of the road. As a pedestrian remember to check both ways before you take a step onto the road. A few years ago we took a break in the Troodos Mountains which was amazing – beautiful countryside and the cooler weather (we travelled in the Autumn) was a welcome relief from the heat of Dubai! This trip was different and even more amazing (if that’s possible). 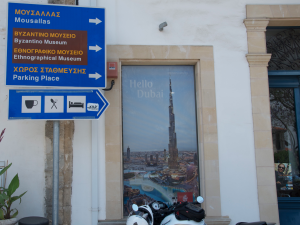 This time we were visiting Paphos and Limassol. We were met by our host at Larnaca Airport and we had an leisurely 2 hour drive to Paphos stopping on the way to take a peek at Aphrodite’s Rock. Aphrodite is the Greek Goddess of love and beauty. It is a magical place. Make sure to take yourself down to the rock and spend time watching the glorious sunset. By the way, beaches in Cyprus are open to the public. There are many many beautiful places to visit – give yourself plenty of time to take a leisurely walk around the different areas and what is offered by Cyprus including the fantastic archaeological sites. There are three UNESCO World Heritage Sites in Cyprus and Paphos itself is one such site with ancient palaces, fortresses, theatres, tombs and of course the very famous Roman mosaics. Cyprus is the place to be! Cyprus is not Greece. The newly elected (January 2015) Mayor of Paphos, Fedonas Fedonos, is terribly proud and rightly so of his country, reminding us that Cyprus is not Greece. Cyprus is keen to promote its country, the permanent residency option and of course investment in property and business. It was announced in early June 2015 that the offshore gas find is commercially viable (Cyprus Block 12) although it may be a few years before it comes onshore. Block 12 is south of Limassol. This statement should encourage investment in Cyprus and we understand that two gas service companies have already moved their offices to Limassol from Dubai. Rents are cheaper and the Limassol Marina is looking good and being developed with quality residential and commercial buildings of the same standard found in other international cities. The infrastructure has also had an upgrade taking into account the expected increase in traffic. None of us quite expected the fantastic generosity and hospitality of the Cypriot people. Hunger or thirst was never ever an issue and we ate in some fantastic restaurants. 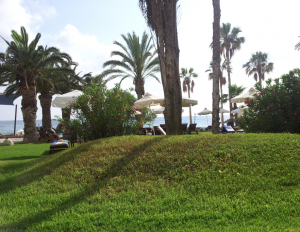 We were guests at the Coral Beach Hotel in Paphos. This hotel is one of five hotels owned by Leptos Calypso Hotels Public Ltd. We stayed in a very pleasant ‘beach suite’ – a lovely spacious suite with everything you need and with patio doors opening out to a private external area with 2 sun loungers, a table and chairs, looking directly onto the gardens and beach. We’d forgotten our adaptor and the concierge kindly obliged which was a godsend – no mad hairdo’s! There is always plenty of hot water and a fabulously powerful shower – heaven. This photograph was taken late in the afternoon but gives you an idea of the greenery in the hotel grounds. 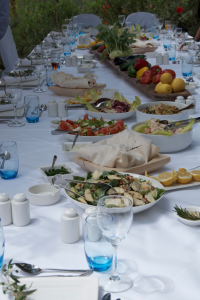 Obviously, everyone looks for different things but we were impressed all round by Cyprus – lovely and varied sea and landscapes, great food (and plenty of it so this is not a country in which you should be shy! ), excellent local wines, beautiful properties in superb locations and great conversations with our new found friends in Cyprus. Ahhhhh. Back to earth we hear you say! We stayed in Paphos and what an interesting town – even beside the hotel there is a neolithic round house. Talking about food – we spent an evening in the very popular Theo’s Restaurant which is on the harbour and with a fantastic view (just beside the castle). Food kept coming and coming (so did the drinks) and by the end of the evening we were all pretty tired – a short bus journey took us back to the hotel where some of my companions went on to smoke shisha in the bar at the Coral Beach Hotel and drink a bit more. Others simply went to bed and fell fast asleep! Paphos is steeped in history so find a decent guide book and get out and about. Everything is within easy reach and a walk around the town will give you a glimpse of the past, present and future – we spotted Dubai’s Burj Khalifa close to the municipality buildings! Before lunch at another incredible and very trendy restaurant with the most magnificent views – The Muse – the Mayor of Paphos, was kind enough to see us on a Saturday in the municipality offices and tell us more about Paphos and what he was looking forward to achieving for Paphos and Cyprus. We think everyone would like to see Paphos and Cyprus develop – it’s a great location for Middle East and European companies and the population of the Republic of Cyprus is only around 850,000. Religion is not an issue with different religions living together in harmony. Apparently, Cyprus is the most religious countries in the EU. There are many mosques and churches to visit – we haven’t checked these websites so unsure if they’re up-to-date. There’s a friendly expat population and properties are still good value for money. Remember to take care when purchasing a property. Like most countries Cyprus has its fair share of people who want to make money at your expense. Check every little detail (we’ll go through this later). 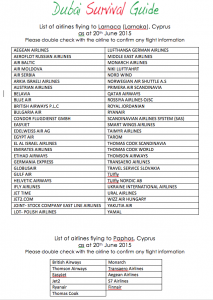 Note: Larnaca can also be written as Larnaka. Limassol can also be written as Lemesos.